I consider this is the most ancient and easy way to break down the password on the BIOS. The steps are easy, first open the casing cover computer CPU. Then find the bios battery that looks something like the battery just a little more big clock (see the pic below for details ). 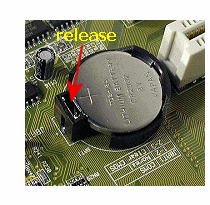 In the area around the battery there is usually a jumper with 3 pins, 2 pins and 1 pin not connected. Suppose the three pins with the code 1 - 2 - 3 connector that connects the initial position usually is 2-3. To reset the bios move the position of the plug that connects pins 2-3 to position 1-2 for about 5 seconds. Then plug it back into the starting position (2-3). Try restarting the computer back on, secured the bios password is gone. 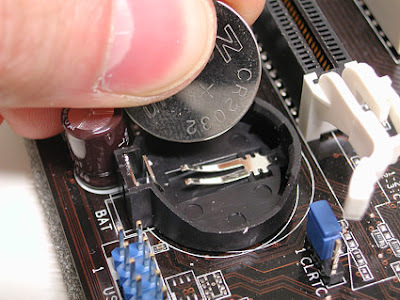 If the above looks complicated, then it is easy to clear CMOS by unplugging the BIOS battery and then put it back. But with the consequences of removing the label is the warranty on the battery BIOS. First move out of the windows and restart your computer, start the computer in MS-DOS mode, use the option "Command Prompt Only". This Procedure is not for all because Backdoor Passwords are only available to the authorized peoples like Manufacturers and Product designers.These passwords are typically used for testing and maintenance. Manufactures typically change the backdoor BIOS passwords from time to time. Every Company have different backdoor passwords for their models . I have just collected some Backdoor Password,check for your brand and use it. Hope it works for you. A.M.I., AAAMMMIII, AMI?SW , AMI_SW, BIOS, CONDO, HEWITT RAND, LKWPETER, MI, and PASSWORD. 01322222, 589589, 589721, 595595, 598598 , ALFAROME, ALLY, ALLy, aLLY, aLLy, aPAf, award, AWARD PW, AWARD SW, AWARD?SW, AWARD_PW, AWARD_SW, AWKWARD, awkward, BIOSTAR, CONCAT, CONDO, Condo, condo, d8on, djonet, HLT, J256, J262, j262, j322, j332, J64, KDD, LKWPETER, Lkwpeter, PINT, pint, SER, SKY_FOX, SYXZ, syxz, TTPTHA, ZAAAADA, ZAAADA, ZBAAACA, and ZJAAADC.